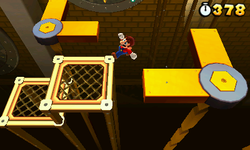 World 7-4 is the fourth level of World 7 in Super Mario 3D Land. Mario starts on a metal platform. After making it across some gears, he should jump across a swinging platform and three moving platforms circling before going into Morty Mole infested tunnels. After that, a Warp Box takes Mario to the Checkpoint Flag. Then after another gear, there are four L-shaped platforms, with the one at the bottom left having a Red Ring on it. The L-shaped platform at the top left leads to two more metal platforms, then there is another L-shaped platform and then there are those three circling platforms that take the player up to the Goal Pole. Star Medal 1: After taking the swinging platform, the player should climb up the left side of the pole and jump off to grab the medal. Star Medal 2: Right after exiting the Morty Mole-filled tunnels, the player should carefully wall jump to reach this medal. They can also hop off the Morty Mole to reach it. Star Medal 3: The player should stay on the end of one of the moving L-shaped platforms after the checkpoint to reach this medal.